With all-wheel-drive poise to make even the most unassertive drivers feel like Scottish rally saint Colin McRae, the Subaru Impreza WRX burst onto the scene in 1992 dominating the WRC through the 90’s and building a Subiephile cult following in the process. More than just a practical and bullet-proof sportscar with excellent build-quality, the 195kw turbo-charged, all-wheel-drive WRX has a knack for getting under your skin with its incredible agility and urge to surge. Subaru then turned the WRX up to 11 with the addition of the STi performance pack (Subaru Tecnica International) of which only 400 of the Version 6 offered here officially arrived in Australia, the first country to receive the STi outside of Japan. The Version 6 STi featured a host of upgrades from forged pistons, enhanced tuning for more mid-range torque, improved handling and goodies like STi bucket seats, 16 inch gold six-spoke alloys, Momo steering wheel, an STi rear wing and signature cherry blossom coloured badging, a very symbolic colour in Japanese culture, tied to the samurai code. 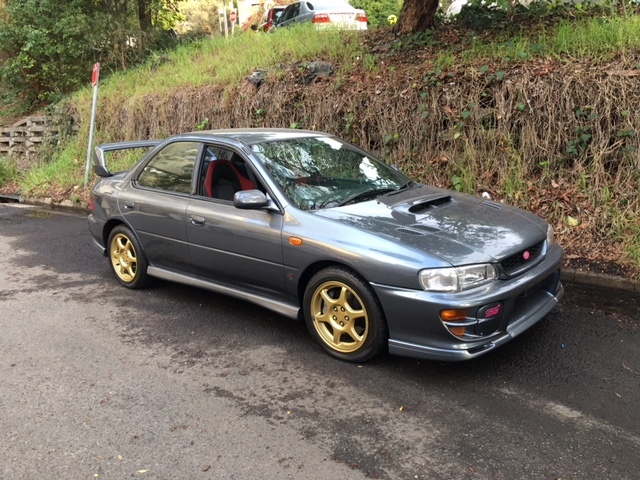 Australian delivered and sold new by Bega Valley Motors in November of 1999 this original and well maintained WRX STi Version 6 is in excellent condition #166. In its original Dark Grey Metallic paintwork with correct gold alloys this car benefits from zero modifications, everything is as per factory original even the original Clarion Radio/CD player. Inside, the soft suede bucket-seat inserts so prone to wear are in excellent order, so too is the leather wrapped MOMO steering wheel and matching gear shifter with contrast red stitching and all dash fittings highlighting the charmed life this car has led. Accompanying the car is the complete service record within its vinyl wallet so often lost with time, a large compilation of service receipts. The original spare wheel and tool kit, the original Subaru keys and even the original delivery window sticker from 1999. To suit a collector or enthusiast this rare, Australian delivered and meticulously maintained Subaru WRX STi Version 6 carries all the hallmarks of what we look for in a blue chip classic car. Great hype surrounding its release, limited production run, unmatched provenance from WRC upbringings to its detailed history file and excellent and original condition, this WRX STi offers a very exciting investment opportunity with prices poised to skyrocket.